I still remember the first time I tasted a kiwi. It was in a class back in grade school. Our teacher brought some in for us to try. None of us had ever seen one before. We were shocked at the bright green insides after examining the little fuzzy brown eggs. I remember thinking parts of it tasted like strawberry and parts tasted like banana. Now I just think it tastes like kiwi. Happy book 4th of July tomorrow! That may be the quickest way, but it’s hard to find the back end of the kiwi…..
Oh, the zipper! Is that what it’s there for! Got to make sure you cut off its beak first. The way I eat them is to cut in half and scoop out the insides with a teaspoon. I… I should make a New Zealand joke here, but I can’t think of anything. Forgive me. Wouldn’t that give the kiwi a metallic taste? and * eat it, not it it. Almost 800th comic! I’m excited! All of my kiwi have switched to Velcro. Wow, youd be amazed at how many people spend frustrating hours trying to open something, and then they realize theres a zipper on the back. Obviously, Biffs not one of those people. You knowm coming from New Zealand and hearing people talk about eating Kiwi, its always kinda funny, as here, Kiwi is a bird that is endangered, Kiwifruit is the fruit to which others refer to as kiwi. A Kiwi is a BIRD! A flightless, nocturnal BIRD! A bird that looks as though God had a bunch of leftover bird and other animal bits and shrugged, mushed them all together and then, upon seeing this thing, decided to hide it far away from where any civilized person could find it. Seriously. I’d know, as I’m in that odd little part of the world where Kiwi and Kiwifruit originate (though there’s debate on the fruit). 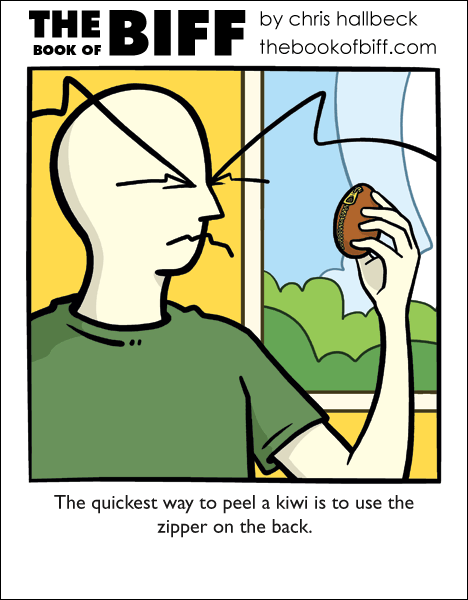 I once got my kiwi’s caught in MY zipper…Unpleasant. I eat the kiwi with the skin on it. Try it. It’s surprisingly good. They fuzz on it is a little disturbing at first but its good. Biff appears to have discovered a new species of fruit fly. Kiwi is my favourite fruit that I’m not allergic to (peaches and plums are more delicious, but I only eat them rarely because I have to get all hopped up on Benadryl first so that I don’t break out in sores). My trick for eating them is to use a spoon. I use the edge of the spoon to cut off a little “cap” at the top, then scoop out the insides, leaving only the skin behind as a little empty husk. I hate how everyone calls them Kiwis. Their proper name is Kiwi fruit. Kiwis are the birds, dammit. Hm… I’ll be sure to try that next time. kiwi was my first fruit, and now it is one my most favorites, but they are so expensive now. I eat my kiwis with a power drill. It’s kind of confusing at first, but you figure it out eventually. Seeing as I have complicated ways of eating fruit, I use a paring knife to peel off the skin (stuff will choke you badly) and then I just eat it whole. Or slice it up if it’s for a fruit salad. I am also a Kiwifruit spooner, yum, lots of vitamin C…Biff just needz to cut the fruit in half! the Kiwi fruit…So rare and exotic…I haven’t had any in years. So, Biff’s trying to unzip it. Be careful, Biff! It’s got little seeds. I eat kiwis with the skin on. I just give it a good wash first to remove anything I wouldn’t want to eat. It’s hald because it’s efficient and half because I am lazy. It also adds a whole new flavour to it. I’m not particularly fond of Kiwifruit. Yeah im also from New Zealand and its odd hearing it called a ‘kiwi’ as to us that is a flightless bird native to NZ and other nations around the world call New Zealanders ‘Kiwi’s’ so its strange hearing it called kiwi instead of kiwifruit haha. Some of you seem to be mistaken. The mistakenly named “kiwifruit” is in fact the imature form of the organisim known in NZ as the Kiwi. In other regions of the world, we simply refer to them as kiwis. The adult Kiwi bird lays its egg, from which grows the ‘kiwifruit,’ which in turn eventually develops the secondary characteristics readily recognizable as belonging to the class Aves. “Scooping out the inside with a spoon,” is a practical method of eating immature kiwis, as at this stage in their development they have not developed awareness/sentience. After a kiwi has become fully mature, the life cycle repeats itself. It is thought by most zoologists that this unusual life cycle is the result of the long association Kiwis have had with interdimentional travel, an association the Kiwi has in common with Owls. It is hypothesized that in alternate dimensions, this form of lifecycle is, if not rare, then at least somewhat common. Similar biological functionality have been observed in the plant kingdom in our own dimension (ie: hesperidia and the oak/squirrel phenomena). That’s what I’m doing wrong!